Poet Lore is a semiannual journal of poetry and reviews. 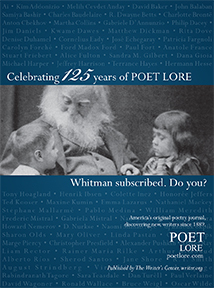 Established in 1889, Poet Lore is the oldest continuously published poetry journal in the United States. As an advertiser in Poet Lore, your organization, business, or service will circulate to 2,000 subscribers and poetry enthusiasts around the nation. File format: We can only accept high-resolution PDF, JPEG, or EPS files. ALL fonts and images MUST be embedded. We CANNOT accept QuarkXpress, Pagemaker, Corel, Word, InDesign, or Publisher files. All colors & images must be converted to grayscale (please note, ads will only be printed in black and white). All files must be set in the appropriate ad dimensions. Submitting files: Files can be e-mailed. Please download and complete the Poet Lore Ad Form.